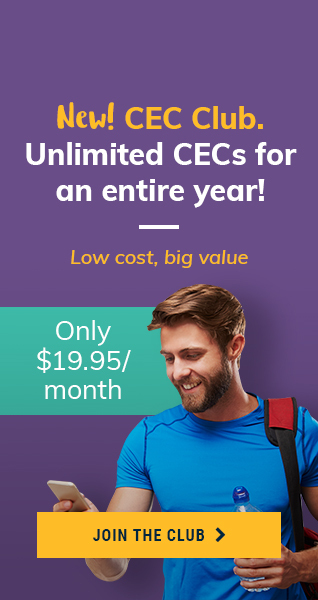 Since they first appeared in fitness facilities in the 1990s, elliptical cross-trainer machines have steadily ranked among the most popular cardio options by gym-goers. Ellipticals provide a moderate-to-vigorous workout, while sparing the joints the high-impact ground reaction forces associated with running and jogging. 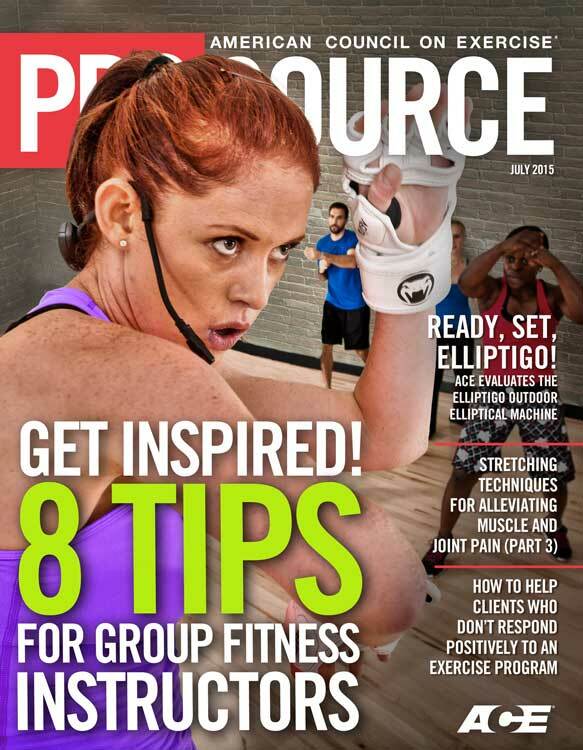 Essentially, you’re getting the results of jogging with the impact of walking, making ellipticals the machine of choice for runners recovering from injury, as well as exercisers just looking for a safe and effective workout. The one knock on ellipticals over the years has been that some users don’t want to be trapped indoors. People who get most of their exercise by walking or running on the treadmill or by riding a stationary bike at the gym can mix things up by heading outdoors when the weather allows. 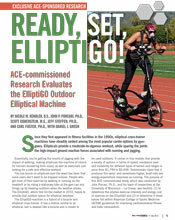 The ElliptiGO, which first hit the market in 2010, hopes to provide that outdoor option for elliptical devotees. The ElliptiGO machine is a hybrid of a bicycle and elliptical cross-trainer. It has a motion similar to an elliptical, but is steered like a bicycle and is meant to be used outdoors. It comes in four models that provide a variety of options in terms of speed, resistance level and suitability for different types of terrain, and ranges in price from $1,799 to $3,499. Testimonials claim that it produces the same, and sometimes higher, heart-rate and energy-expenditure responses as running. 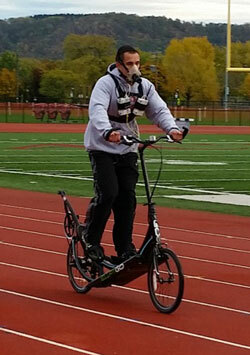 The purpose of this ACE-commissioned study, which was conducted by John Porcari, Ph.D., and his team of researchers at the University of Wisconsin – La Crosse, was twofold: (1) to determine the relative exercise intensity and energy cost of exercise on the ElliptiGO and (2) to determine if these values fall within American College of Sports Medicine (ACSM) guidelines for improving cardiorespiratory fitness and body composition. ACSM guidelines recommend that adults engage in a minimum of 150 minutes of aerobic activity per week (ACSM, 2014). The exercise should be conducted at 64 to 94 percent of maximal heart rate or 40 to 85 percent of VO2max. This can be divided up into 30-minute bouts of moderate-intensity activity five days per week or 20-minute bouts of vigorous activity on three days of the week. According to a self-report study from the Centers for Disease Control and Prevention (CDC, 2014), only one in five adults are meeting these recommendations for aerobic exercise. Sixteen apparently healthy adults between the ages of 18 and 45 were recruited for this study. All participants had previous experience using elliptical machines, performed at least 150 minutes of aerobic activity each week and were free of any orthopedic or cardiovascular contraindications. Each subject participated in three 15- to 20-minute practice sessions on the ElliptiGO before completing a graded maximal exercise test on a treadmill and a 30-minute exercise session on the ElliptiGO. During the graded exercise test, the research team measured expired air and metabolic responses, in addition to recording each participant’s ratings of perceived exertion (RPE) at the end of each stage of the test using the Borg 6 to 20 scale. During the 30-minute exercise session, which was only conducted after the researchers deemed the participant proficient on the machine, heart rate was recorded each minute along with VO2 as the subject exercised at a self-selected pace. Session RPE was also recorded. 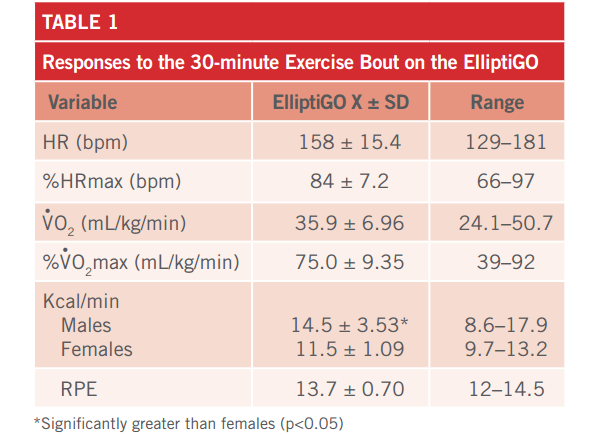 Exercise responses to the ElliptiGO exercise session are presented in Table 1. As there were no significant differences in the responses of males and females (with the exception of caloric expenditure), this table presents the overall responses. Relative heart-rate responses (%HRmax) during each minute of the 30-minute exercise session on the ElliptiGO are illustrated in Figure 1. The boxed area represents the ACSM (2014) guidelines for eliciting a cardiorespiratory training benefit (64 to 94 percent of HRmax). This figure indicates that exercise intensity during each minute of the ElliptiGO session fell within the ACSM recommendations. 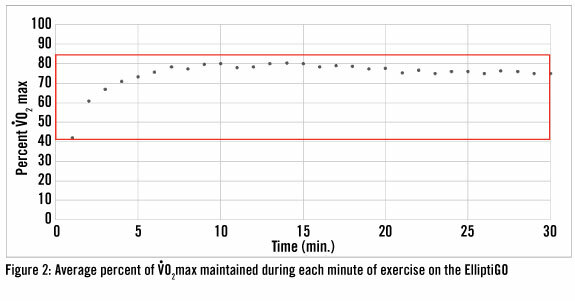 Relative oxygen consumption (%VO2max) of the subjects for every minute of the 30-minute ElliptiGO exercise session are illustrated in Figure 2. Again, the box indicates the ACSM (2014) guidelines for maintaining or improving aerobic fitness (40 to 85 percent of VO2max). Participants were able to maintain exercise in this intensity range for the duration of the workout. ACSM guidelines suggest that healthy adults work out between 64 and 94 percent of HRmax or 40 and 85 percent of VO2max in order to maintain and/or improve cardiorespiratory fitness. The findings of this study demonstrate that exercising at a self-selected intensity on the ElliptiGO met ACSM guidelines on both accounts. Subjects exercised at an average of 84 percent of HRmax and 75 percent of VO2max during the 30-minute exercise session. The male participants in this study burned an average of 436 kcal during the 30-minute workout, while the female subjects burned an average of 356 kcal. The difference is due to the larger body mass of the male participants, who on average were about 20 pounds heavier than their female counterparts. It is important to note that these calorie numbers are above the 200 to 300 calories per session that current guidelines state are needed to manage or lose weight (ACSM, 2014). Finally, the average RPE of 13.7 (on the 6 to 20 scale) is indicative of a “somewhat hard” intensity, which again falls within the ACSM recommendations. 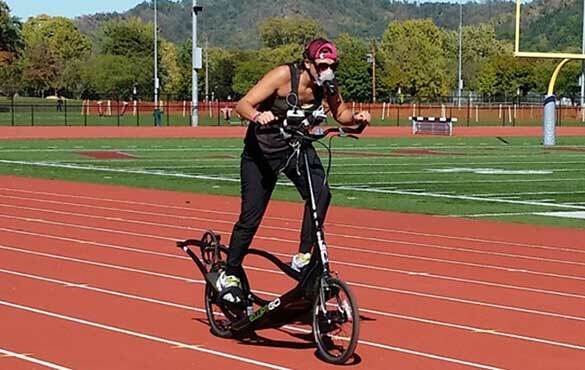 The first thing that both Dr. Porcari and Nicole Rendler, the lead author of this study, mentioned when discussing the experience of conducting this research was how much fun the participants had on the ElliptiGO machine. This is impressive, considering the study was conducted on a 400-meter track and not on the open road. Dr. Porcari points out that when using the machine recreationally, “you are able to cover a lot of territory and it’s really fun to explore.” In fact, a typical workout could cover as much as 10 to 15 miles. The ElliptiGO should be treated like a bicycle when it comes to the rules of the road. Be sure that you and your clients use bike lanes, ride single-file and adhere to traffic laws. While the machine is not really suited for rough terrain like hiking trails, any paved path is a good option. It might be best to avoid the open road and instead ride on greenways, in parks and on bike paths whenever possible. Stated simply, the ElliptiGO offers a safe, low-impact workout that falls within the ACSM intensity recommendations, no matter what measure you use. And, by all accounts, it’s a lot of fun, which is more important than it sounds. Clients tend to be intrinsically motivated to be physically active when they truly enjoy their workouts—which is associated with positive attitudes and emotions (such as happiness, freedom and relaxation), as well as maximal effort and persistence when faced with barriers. What more could you want from a piece of exercise equipment? According to a self-report study from the Centers for Disease Control and Prevention, _______________ adults meet the minimum recommendation of 150 minutes of aerobic exercise per week. 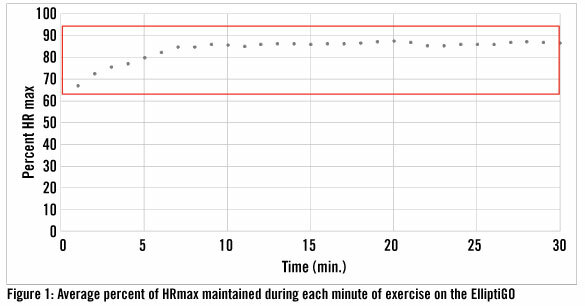 Subjects in the study exercised at an average of __________ percent of HRmax during the 30-minute session.